Friday, Friday, Friday! We all live for the weekends. No more @ The Event…from this day forth it’s Where To. Different title, but same formula. We go from city to city, country to country to get find great events and things to do. From Texas to Tennessee. Nashville that is. Over the past weekend, I visited the capital of this beautiful state. You can find all kinds of great things to do in Music City! What can you do for art, music, and other events in Nashville? Plenty. I wanted to really explore the city a lot more, but I wasn’t able to because we didn’t have more time, but I’ll return again sometime next year. One place that one on my agenda was The Parthenon. The city of Nashville first undertook the construction of a full-scale replica of the Parthenon for the 1897 Tennessee Centennial Exposition. Many cities and states, major industries, and other interest groups also built pavilions for the celebration. Nashville’s pavilion was constructed of brick, wood lath, and plaster, and represented the city’s reputation as the “Athens of the South” The Parthenon housed the art exhibition, which consisted of 1,172 pieces from all over the world. The building was so popular that the city left the temporary structure standing after the Exposition. In 1920, faced with crumbling pediments and decaying plaster, the city authorized the reconstruction of the landmark with permanent materials. Rather than rebuilding the structure exactly as it appeared in the Exposition, the city decided to create a complete replica of the original Greek temple, both inside and out. What had been the basement of the 1897 Parthenon became gallery space in order to continue the Nashville Parthenon’s history of exhibiting fine art. On May 21, 1931, the Parthenon reopened to the public, attracting over 10,000 visitors from 46 states and 12 foreign countries during its first month. 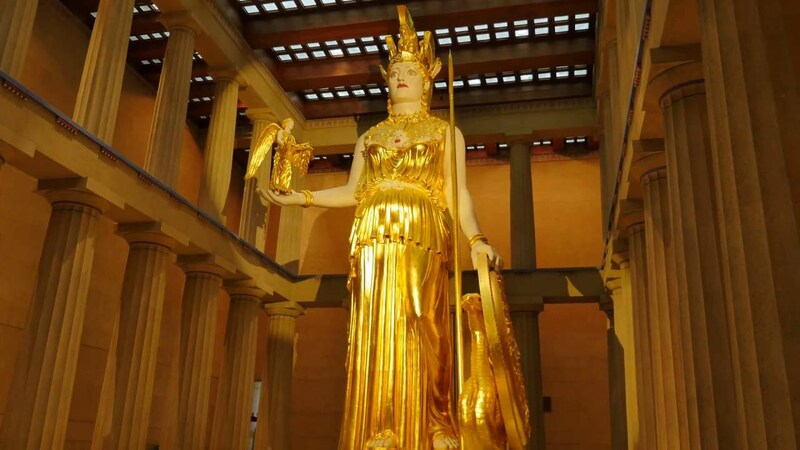 The first floor you’ll see exhibitions of painting, statues and other works, but it’s on the second floor you’ll find Athena, goddess of wisdom, prudent warfare and the useful arts; patron deity of the city of Athens. The statue stands 41′ 10″ tall, from the floor all the way to the top center crest of her helmet. She’s made of gypsum cement reinforced with fiberglass, on a steel frame. The statue was commissioned in 1982 and was unveiled in May 1990. Go to the website below Hours of operations, administrations, and other information. I enjoyed it and wasn’t disappointed. I need to go back there again. Other places to you can visit are Country Music Hall of Fame® and Museum, RCA Studio B, LeQuire Gallery, Frist Center for the Visual Arts, Grand Ole Opry. So many more events and things to see. Go to www. visitmusiccity.com for more places and events to check out. I’m gonna go back to get the full experience of Nashville has to offer.